I have been very interested in this since I myself am interested in reversing my skin's aging/genes/damage/etc. I also am interested in volunteering any future genetic altering of skin quality. Basically I've heard of experimental drugs called senoyltics that are believed to (and have actually done so) have the ability to truly reverse aging at the cellular level and/or aging damage of skin and etc. I am very intrigued and want to know if this is feasible for humans yet -- or any such breakthroughs. I really want my skin's genetic quality to be enhanced, but reversing aging damage by genes will suffice. So skin aside, in general, is reverse senescence (with or without senolytics) anywhere near possible to reach human success? I've heard of labs and etc. working on this for testing, but nothing more. My question is basically: is it possible? Are we really in the near future to reversing aging in humans? 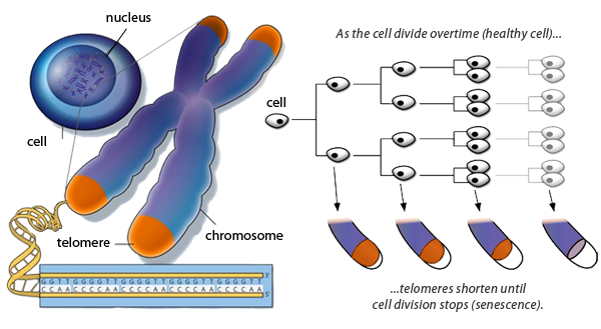 You might be interested in learning about telomeres, telomerase, and telomerase gene therapy. For example, Boccardi & Herbig (2012): describe a mouse study in which they used telomerase gene therapy to improve the healthspan and lifespan of mice by up to 24%. As far as I know, we have no successful human trials of similar therapies that have targeted and succeeded at "decreasing the age" of humans. Telomere: non-coding nucleotide sequences on the tips of chromosomal DNA strands. Due to the inability for DNA polymerase to replace RNA primers on the end of linear strands of eukaryotic DNA during DNA replication, ~50-100 base pairs are removed from the daughter strand from each replication event. As we age, telomeres in most of our tissues progressively become shorter and therefore likely contribute to the failure of our organs and tissues observed in old age. Supporting this are data demonstrating that healthy lifespan is positively correlated with longer telomeres in humans, and patients suffering from age‐related diseases and premature aging syndromes display shorter telomeres compared to healthy individuals (Zhu et al, 2011). The enzyme, telomerase can replace these telomeres, but telomerase is really only active in stem cells and white blood cells, so most adult cells lack this regeneration ability. This is where telomerase gene therapy comes into play. *Note: As far as I know, we don't actually know whether short telomeres are simply an effect of aging or if they are actually the cause of aging (and ultimately death), so this gene therapy is running on an relatively unsupported hypothesis. For example: Boccardi & Herbig (2012) "Telomerase gene therapy: a novel approach to combat aging". They found that adding telomerase to 1 year old mice increased their lifespan by 24%. As Boccardi & Herbig (2012) note, however, applied human studies are still a thing of the future. While these studies provide a proof‐of‐principle that telomerase gene therapy is a feasible and generally safe approach to improve healthspan and treat disorders associated with short telomeres, a clinical application in humans is likely still some time away. Zhu, H., Belcher, M. and Van Der Harst, P., 2011. 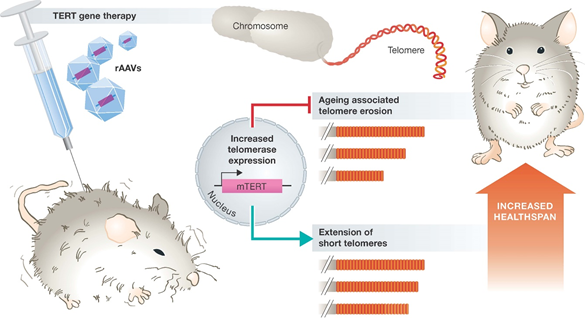 Healthy aging and disease: role for telomere biology?. Clinical Science, 120(10), pp.427-440. Not the answer you're looking for? Browse other questions tagged human-biology pharmacology senescence life dna-damage or ask your own question. Is it theoretically possible to create two humans by splitting one human in two?